Background Anaemia is a significant public health challenge in Myanmar. In 2015–2016, the first demographic and health survey was done in Myanmar, and showed that almost half of all pregnant women had anaemia. To inform policy decisions, this secondary analysis of the Myanmar Demographic and Health Survey 2015–16 was done to determine the geographical disparities in prevalence of anaemia and related factors among women of reproductive age. Methods Analyses were based on weighted samples of 12 489 eligible women aged 15–49 years. Regions and states were clustered into four geographical zones: hilly, coastal, delta and central plain zones. Baseline characteristics were analysed by descriptive statistics. Odds ratios and 95% confidence intervals (CIs) were estimated using univariable and multivariate logistic regression. Results The prevalence of anaemia varied by geographical zone. Compared with women in the hilly zone, women of the coastal zone had adjusted odds of having anaemia of 1.7 (95% CI 1.43–2.05), while for those in the delta and central plain zones, the adjusted odds were 1.6 (95% CI 1.41–1.92 and 1.38–1.88, respectively). Other factors that significantly raised the adjusted odds of having anaemia were being married, pregnant, underweight/thin or aged ≥40 years, and parity of more than six children. By contrast, urban residence, educational status, employment status and wealth status were not significantly associated with anaemia. Conclusion Anaemia among women of reproductive age is a major public health problem in Myanmar, and those in the coastal region are the most vulnerable. Introducing provision of iron tablets for non-pregnant women, and improving the current low levels of provision to pregnant women, would be a simple and effective policy. As with other health outcomes, further analyses on disparities in anaemia among women of reproductive age at the state and regional level in Myanmar are warranted. Anaemia among women of reproductive age is a public health challenge for many low- and middle-income countries, with long-term negative consequences for health, social and economic development. In 2012, the World Health Assembly Resolution 65.6 endorsed the Comprehensive implementation plan on maternal, infant and young child nutrition. This specified six global nutrition targets for 2025, the second of which is a 50% reduction in anaemia in women of reproductive age. The results of an analysis of population-representative data worldwide indicated that, in 2011, 29% of non-pregnant women and 38% of pregnant women aged 15–49 years had anaemia., In addition, mean haemoglobin concentrations and the prevalence of anaemia were highest in central and west Africa and south Asia., Anaemia is a significant challenge in the World Health Organization (WHO) South-East Asia Region, where, in 2011, more than 200 million women of reproductive age had anaemia, including 191 million non-pregnant women and 11.5 million pregnant women. A regional expert consultation in 2016 noted that anaemia is a severe public health problem in Bangladesh, India, Myanmar and Nepal, where coverage of anaemia programmes is inadequate; safe water and sanitation status is moderate or poor; rates of open defecation are significant; the incidence of diarrhoeal diseases is high; and, in specific areas, there is a significant prevalence of malaria. Myanmar is the largest country in mainland South-East-Asia, and is classified by the World Bank as a “least developed country”. The latest census was in 2014 and reported a population of about 51.5 million, of which 70% are living in rural and 30% in urban settings. Despite the country’s abundant natural resources and local development plans, poverty and socioeconomic inequalities within and among the states and regions are challenging. Administratively, Myanmar comprises Nay Pyi Taw Council, seven states and seven regions. Geographical disparities in health outcomes are long established, and some states and regions are particularly affected. A health system review of the country in 2014 by the Asia Pacific Observatory on Health Systems and Policies noted that “Addressing health inequities is of paramount importance for Myanmar, needing a major reform that will ensure health care services reach the poor and the disadvantaged groups, minority groups in particular, and in conflict-affected and hard-to-reach areas”. The Myanmar Demographic and Health Survey (MDHS) 2015–16 was the first survey of its kind to be implemented in the country as part of the worldwide programme of demographic and health surveys. This survey showed that the rate of malnutrition in Myanmar is among the highest in Asia, with one in three children stunted and 7% acutely malnourished. Nearly 60% of children aged 6–59 months and almost half of pregnant women had anaemia. As with other health outcomes, the prevalence of anaemia among women of reproductive age varied, with the highest, at 55%, in Rakhine State and Tanintharyi Region. To date, there has been no research on anaemia among women of reproductive age in Myanmar using a nationally representative sample. The objective of this study was to determine the geographical disparities in prevalence of anaemia and related factors from the MDHS (2015–2016) data, to inform evidence-based policy and priority interventions. This is a secondary data analysis of the MDHS (2015–2016), which was a cross-sectional nationally representative population-based survey conducted by the Ministry of Health and Sports. A two-stage sample of households was used (441 clusters; 30 households per cluster), stratified by urban and rural areas in the 15 states and regions. Because of the non-proportional sample allocation, data were weighted such that results were representative at the national and regional/state levels. Further details have been published elsewhere. The MDHS (2015–2016) collected data on social, behavioural and demographic indicators, including health status and reproductive health issues, from women aged 15–49 years and men aged 15–59 years. This analysis was based on weighted samples of women of reproductive age (15–49 years), from all 15 administrative states and regions of Myanmar. Anaemia was defined in the MDHS (2015–2016) as a blood haemoglobin level below 12.0 g/dL in non-pregnant women and below 11.0 g/dL in pregnant women. Capillary blood from a finger prick, collected in a microcuvette, was used to test for anaemia. Haemoglobin analysis was carried out on site. Detailed information on the methods is provided in the MDHS (2015–2016) report. For this analysis, the 15 states and regions were grouped into four geographical zones: hilly, coastal, delta and central plain. The hilly zone includes Chin State, Kachin State, Kayah State, Kayin State and Shan State. The coastal zone includes Mon State, Rakhine State and Tanintharyi Region. The delta zone includes Ayeyarwady Region, Bago Region and Yangon Region. The central plain zone includes Magway Region, Mandalay Region, Nay Pyi Taw and Sagaing Region. Other variables assessed were the household characteristics (urban/rural residence, wealth-index quintile) and individual characteristics (age, educational status, marital status, employment status, body mass index [BMI; underweight/thin: <18.5 kg/m2, normal: 18.5–24.9 kg/m2, overweight: 25.0–29.9 kg/m2, obese: ≥30.00 kg/m2], and pregnancy status). All independent variables were analysed as categorical variables. Data analysis was done using STATA (StataCorp. Released 2017. Stata Statistical Software, Version 15. College Station, TX: StataCorp LLC). Missing values and weighted samples were checked. Baseline characteristics were analysed by descriptive statistics. Odds ratios (ORs) and 95% confidence intervals (CIs) were estimated using univariable and multivariate logistic regression. All test statistics were two-sided and a P value of less than 0.05 was considered statistically significant. The datasets of the MDHS (2015–2016) were accessed with permission from ICF International. The primary demographic and health survey data were collected in accordance with international and national ethical guidelines. A total of 12 885 women aged 15–49 years participated in the MDHS (2015–2016), corresponding to a response rate of 96%. After exclusion of women for whom data were missing, the final weighted sample of women of reproductive age in this analysis was 12 489. The background characteristics of these women by geographical zone are shown in [Table 1]. In all four zones, the majority were living in rural settings, were aged less than 40 years, were not employed, had a normal BMI, and were not pregnant. Other than in the delta zone, most women had an education level of primary or below. With respect to wealth quintile, the coastal zone had the highest proportion of women in the poorest quintile (35.6%), and the lowest proportion (13.6%) in the richest quintile. The overall national prevalence of anaemia among women of reproductive age was 46.5%. [Figure 1] shows the prevalence by geographical zone. 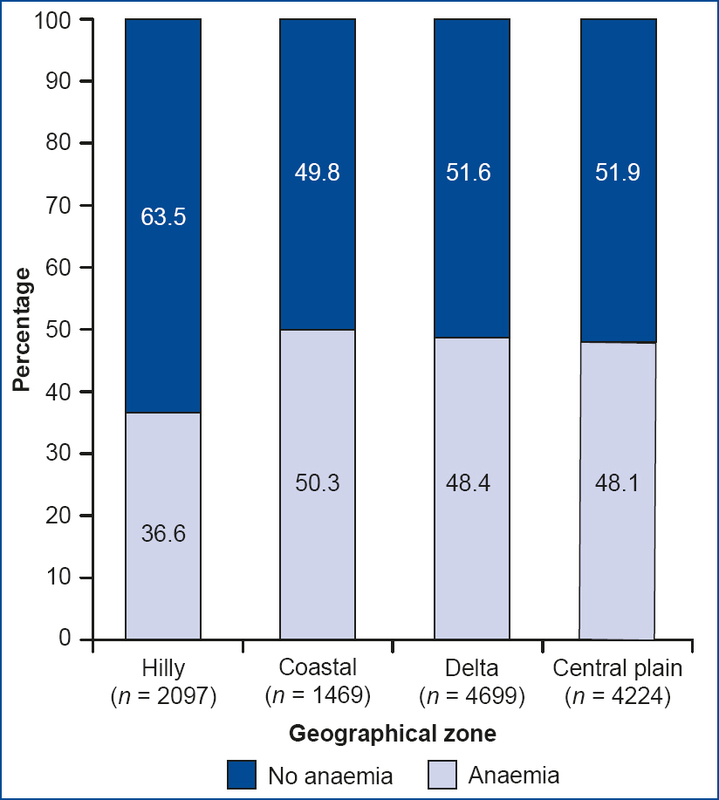 The lowest prevalence was found in the hilly zone (36.7%) and the highest prevalence was in the coastal zone (49.8%). 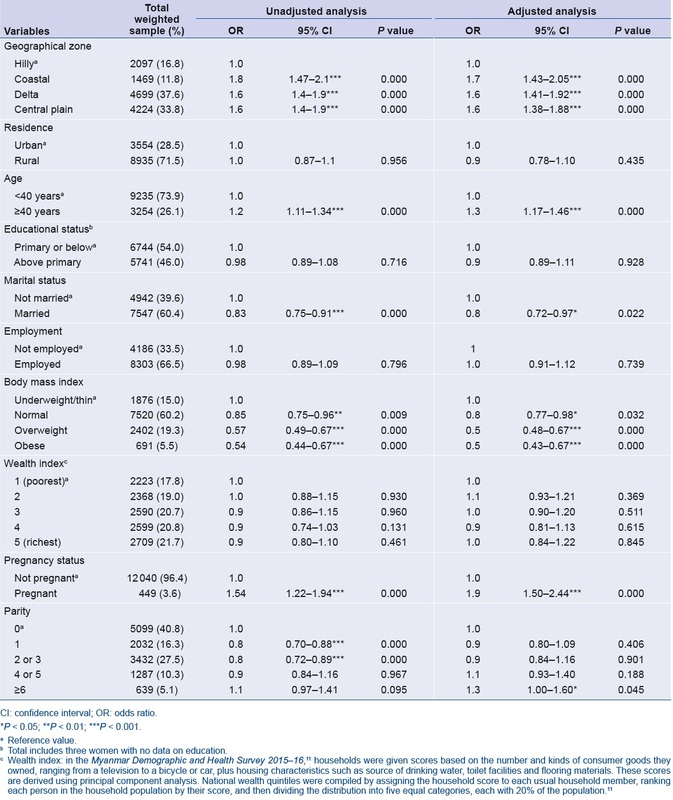 The results of the unadjusted and adjusted logistic regression analyses of the determinants of anaemia in women of reproductive age in Myanmar are shown in [Table 2]. In both unadjusted and adjusted analyses, the variables associated with anaemia were geographical zone, age, marital status, BMI, pregnancy status and parity of more than six children. By contrast, urban/rural residence, educational status, employment status and wealth status were not statistically associated with anaemia in women of reproductive age. After controlling for the other variables, compared with women in the hilly zone, women of the coastal zone had odds of 1.7 (95% CI 1.43–2.05) of having anaemia, while those in the delta and central plain zones had odds of 1.6 of having anaemia (95% CI 1.41–1.92 and 1.38–1.88, respectively). 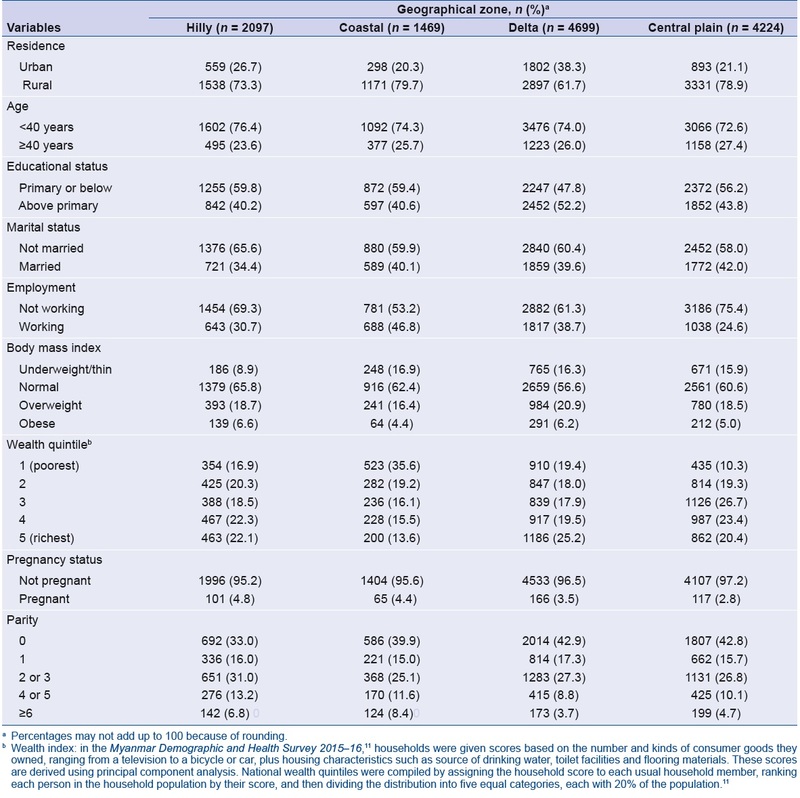 Women aged ≥40 years had an adjusted OR of 1.3 (95% CI 1.17–1.46) of having anaemia; women who were pregnant had an adjusted OR of 1.9 (95% CI 1.50–2.44) of having anaemia; and women who were married were 17% less likely to have anaemia than women who were not married. Women who were underweight/thin were more likely to have anaemia than women with normal or above-normal BMI. For example, women with a normal BMI had a 15% lower risk of having anaemia than underweight/thin women (see [Table 2]). Other factors that significantly raised the adjusted odds of having anaemia were being married, pregnant, underweight or aged ≥40 years, and parity of more than six children. By contrast, urban residence, educational status, employment status and wealth status were not significantly associated with anaemia. The MDHS (2015–2016) was the first survey of its kind in Myanmar, and gives the opportunity to explore anaemia in women of reproductive age using a nationally representative sample. The overall prevalence of anaemia in women of reproductive age in Myanmar was 46.5%, which is higher than the WHO-estimated average in 2011 of 41.9% for the WHO South-East Asia Region overall. Analyses of demographic and health survey data from other countries have found an inverse relationship between wealth quintile and anaemia.,,, One study conducted in the hilly zone of Myanmar during 2014 also found an inverse relationship between family per capita income and anaemia in lactating women. However, in this analysis of MDHS (2015–2016) data, there was no relationship between wealth quintile and the presence of anaemia in women of reproductive age. Similarly, no relation was found with other socioeconomic factors, such as urban/rural residence, education level or employment. These findings are consistent with two previous cross-sectional studies in Myanmar: one conducted in the hilly zone during 2014, and the second in a tertiary hospital of the central plain zone during 2012–2013. Nutritional deficiencies, mainly of iron, caused by inadequate diet are the predominant immediate cause of anaemia in women of reproductive age in the WHO South-East Asia Region. One possible reason for the lack of association of anaemia with socioeconomic factors in the overall sample of women in the MDHS (2015–2016) could be that low-cost, high-nutrient diets are made possible by the availability of fish, particularly in the coastal and delta zones of Myanmar. However, compared with the hilly zone, women in the other three zones were more likely to have anaemia, especially in the coastal zone. The coastal and delta zones are prone to natural disasters, including cyclones, flooding and landslides, which tend to lead to food insecurity through the destruction of productive assets, increases in food prices and decreases in wages. Localized conflict has negatively impacted the food and nutrition security of households in Myanmar in several important ways. Conflict has resulted in reduced access to markets and health facilities, increases in food prices, and loss of livelihoods, among many other serious consequences for affected populations. In Rakhine State, in the coastal zone, conflict has been a major contributory factor for poor maternal and child nutrition. Recent data on the prevalence of micronutrient deficiencies among women and children in Myanmar are lacking, and a new Myanmar micronutrient and food consumption survey (MMFCS) is under way. However, the most recent previous survey, in 2005, found that levels of intestinal worm infestation were especially high in the coastal zone: 92% of pregnant women and 70% of children had infestation with one or more of three common worm types (Ascaris, Trichuris and hookworm), compared with the national estimates of 45% and 31%, respectively. Iron deficiency is exacerbated by the presence of intestinal parasites. MDHS (2015–2016) data showed that only 55% of women took deworming tablets during their most recent pregnancy. Immediate causes of anaemia in women of reproductive age in the WHO South-East Asia Region are nutritional deficiencies caused by inadequate diet; infections, particularly parasitic diseases; and genetic disorders such as thalassaemia. The prevalence of haemoglobinopathies – haemoglobin E, alpha-thalassaemia and beta-thalassaemia – is high among women of reproductive age in Myanmar. Intermediate causes of anaemia in women of reproductive age in the region include unsafe water and poor hygiene and sanitation. The MDHS (2015–2016) data show that 89% of urban households and 77% of rural households in Myanmar have access to an improved source of drinking water. Almost half of all households have an improved sanitation facility; however, less than 1% have a flush toilet linked to a sewer system. It is likely that anaemia is due to a combination of causes that coexist, with individual contributions varying in different settings. Since anaemia is the result of multiple factors, a better understanding of the factors discussed above will be important to understanding the main drivers of anaemia in the different geographical zones. By contrast with socioeconomic factors, biological and pregnancy status were the main determining factors for anaemia in women of reproductive age. The significant role of these factors has been demonstrated in many settings. The policy of the Ministry of Health and Sports is to provide vitamin A supplements to postpartum women (200 000 IU) within 42 days of their delivery; provide iron supplements (180 tablets during pregnancy) and deworming tablets (one tablet after the first trimester) to pregnant women; and offer education on eating iron-rich foods and avoiding parasites, to prevent anaemia. However, according to the MDHS (2015–2016) data, only 35% of women aged 15–49 years who gave birth in the 5 years before the survey received vitamin A supplementation during the first 2 months after delivery. More than 40% of women did not take iron supplements for at least 90 days during their pregnancy and 12% took none. The Global Burden of Disease Study 2015 ranked iron-deficiency anaemia as the fourth-leading cause of years lost to disability worldwide. Anaemia has an impact on the health status of mothers and their children, and on the country’s productivity and overall socioeconomic development. More efforts should therefore be made to ensure that the government guidance on supplementation and advice for pregnant women is followed. Iron supplementation should also be expanded to cover non-pregnant women of reproductive age. There is also a need for health-care workers and allied personnel to improve communication and targeted messages on the important role of iron tablets for all women of reproductive age, as well as pregnant mothers, to prevent anaemia. This action could further support commitments to the Sustainable Development Goals, as well as the Global Nutrition Target 2025 for anaemia. This study has certain limitations. The 15 regions and states of Myanmar were clustered into four geographical zones to facilitate broad country-wide comparisons. Local approaches will require more detailed analysis of data at the state or regional level. Anaemia still remains a major public health problem for women of reproductive age in Myanmar. There are geographical disparities in prevalence, and women in the coastal zone were the most vulnerable. Among the variables available for analysis, the main drivers were biological and pregnancy-related factors rather than socioeconomic factors. Further analyses on disparities at the state or regional level are needed, as well as on disparities in other health outcomes in Myanmar. Focusing on providing iron tablets for women of reproductive age, and improving provision to pregnant women, would be a simple and effective policy. Further work on holistic local development plans will be vital to reduce disparities among the regions and states of Myanmar. Acknowledgements: This research is a product of the 2018 Subregional DHS Further Analysis Workshop, held in Pokhara, Nepal, 8–18 January 2018. The authors acknowledge Dr Thet Thet Mu (Deputy-Director General of Myanmar Ministry of Health and Sports), the United States Agency for International Development and ICF International for access to data and technical assistance. Authorship: Both authors contributed equally to this paper. Comprehensive implementation plan on maternal, infant and young child nutrition. Geneva: World Health Organization; 2014 (WHO/NMH/NHD/14.1; http://apps.who.int/iris/bitstream/handle/10665/113048/WHO_NMH_NHD_14.1_eng.pdf?ua=1">http://apps.who.int/iris/bitstream/handle/10665/113048/WHO_NMH_NHD_14.1_eng.pdf?ua=1, accessed 14 June 2018). Global Nutrition Targets 2025. Anaemia policy brief. Geneva: World Health Organization; 2014 (WHO/NMH/NHD/14.4; http://apps.who.int/iris/bitstream/handle/10665/148556/WHO_NMH_NHD_14.4_eng.pdf?sequence=1, accessed 14 June 2018). Yasutake S, He H, Decker MR, Sonenstein FL, Astone NM. Anemia among adolescent and young women in low-and-middle-income countries. Int J Child Health Nutr. 2013;2:105–12. The global prevalence of anaemia in 2011. Geneva: World Health Organization; 2015 (http://apps.who.int/iris/bitstream/handle/10665/177094/9789241564960_eng.pdf?sequence=1, accessed 14 June 2018). Stevens GA, Finucane MM, De-Regil LM, Paciorek CJ, Flaxman SR, Branca F et al. Global, regional, and national trends in haemoglobin concentration and prevalence of total and severe anaemia in children and pregnant and non-pregnant women for 1995–2011: a systematic analysis of population-representative data. Lancet Glob Health. 2013;1(1):e16–25. doi:10.1016/S2214-109X(13)70001-9. Strategies to prevent anaemia: recommendations from an expert group consultation. New Delhi, India, 5–6 December 2016. New Delhi: World Health Organization Regional Office for South-East Asia; 2016 (http://www.searo.who.int/entity/nutrition/recommendations_on_anaemia1.pdf?ua=1, accessed 14 June 2018). The World Bank. Least developed countries: UN classification (https://data.worldbank.org/region/least-developed-countries:-un-classification, accessed 14 June 2018). The 2014 Myanmar Population and Housing Census. The Union Report: census report volume 2. Nay Pyi Taw: Department of Population, Ministry of Immigration and Population; 2015 (http://www.burmalibrary.org/docs22/2014-Census-Volume2C-Religion-red.pdf, accessed 14 June 2018). Ko MK, Sawaengdee Y. Child mortality differentials of selected ethnic groups in Myanmar, 1997–2007. J Health Res. 2014;28(6):373–80 (http://www.thaiscience.info/Journals/Article/JHRE/10972195.pdf, accessed 14 June 2018). Asia Pacific Observatory on Health Systems and Policies. The Republic of the Union of Myanmar health system review. Manila: World Health Organization Regional Office for the Western Pacific; 2014 (Health Systems in Transition, Vol. 4 No. 3; http://apps.who.int/iris/bitstream/handle/10665/208211/9789290616665_eng.pdf;jsessionid=0791B726ED5F46CA70F1FBF55528B5DA? sequence=1, accessed 14 June 2018). Myanmar Demographic and Health Survey 2015–16. Naypyitaw: Ministry of Health and Sports; 2017 (https://dhsprogram.com/pubs/pdf/FR324/FR324.pdf, accessed 14 June 2018). Hakizimana D. Risk factors of anemia among women of reproductive age in Rwanda: a secondary data analysis of Rwanda Demographic and Health Survey (RDHS) 2014/2015. Butare: College of Medicine and Health Sciences (CMHS); 2016 (http://dr.ur.ac.rw/bitstream/handle/123456789/219/DIEUDONNE%20HAKIZIMANA.pdf?sequence=1&isAllowed=y, accessed 14 June 2018). Lakew Y, Biadgilign S, Haile D. Anaemia prevalence and associated factors among lactating mothers in Ethiopia: evidence from the 2005 and 2011 demographic and health surveys. BMJ Open. 2014;5(4):e006001. doi:10.1136/bmjopen-2014-006001. Balarajan YS, Fawzi WW, Subramanian SV. Changing patterns of social inequalities in anaemia among women in India: cross-sectional study using nationally representative data. BMJ Open. 2013;3(3):pii:e002233. doi:10.1136/bmjopen-2012-002233. Wilunda C, Massawe S, Jackson C. Determinants of moderate-to-severe anaemia among women of reproductive age in Tanzania: analysis of data from the 2010 Tanzania Demographic and Health Survey. Trop Med Int Health. 2013;18(12):1488–97. doi:10.1111/tmi.12199. Zhao A, Zhang Y, Li B, Wang P, Li J, Xue Y et al. Prevalence of anemia and its risk factors among lactating mothers in Myanmar. Am J Trop Med Hyg. 2014;90(5):963–7. doi:10.4269/ajtmh.13-0660. Zhao A, Cao S, Gao H, Xiao Q, Win N, Zhang Y. Anemia among lactating mothers in Kokang, Myanmar. Southeast Asian J Trop Med Public Health. 2016;47(6):1298–305 (http://www.tm.mahidol.ac.th/seameo/2016-47-6/19-66193-1298.pdf, accessed 14 June 2018). Oo KT, Myint TT, Nyunt KK, Yi KH. Factors associated with anaemia in pregnancy. Myanmar Health Sciences Research Journal. 2016;28(3):151–6 (http://www.myanmarhsrj.com/file/display_fulltext.php?articleid=Reg-000817&issue=3&vol=28, accessed 14 June 2018). Belton B, Hein A, Htoo K, Kham LS, Nischan U, Reardon T et al. Aquaculture in transition: value chain transformation, fish and food security in Myanmar. International development working paper 139. East Lansing (MI): Department of Agricultural, Food, and Resource Economics and the Department of Economics, Michigan State University; 2015 (https://www.lift-fund.org/sites/lift-fund.org/files/publication/AQUACULTURE%20IN%20TRANSITION_0.pdf, accessed 14 June 2018). Undernutrition in Mayanmar. Part 1: a critical review of literature. March 2016. Yangon: Livelihoods and Food Security Trust Fund; 2016 (https://www.lift-fund.org/sites/lift-fund.org/files/uploads/LEARN%20Report%20Part%201.compressed.pdf, accessed 14 June 2018). Bancone G, Gilder ME, Chowwiwat N, Gornsawun G, Win E, Cho WW et al. Prevalences of inherited red blood cell disorders in pregnant women of different ethnicities living along the Thailand-Myanmar border [version 2; referees: 2 approved]. Wellcome Open Res. 2017;2:72. doi:10.12688/wellcomeopenres.12338.2. GBD 2015 Disease and Injury Incidence and Prevalence Collaborators. Global, regional, and national incidence, prevalence, and years lived with disability for 310 diseases and injuries, 1990–2015: a systematic analysis for the Global Burden of Disease Study 2015. Lancet. 2016;388(10053):1545–602. doi:10.1016/S0140-6736(16)31678-6. Sustainable Development Knowledge Platform. Sustainable Development Goal 3. Ensure healthy lives and promote well-being for all at all ages (https://sustainabledevelopment.un.org/sdg3, accessed 14 June 2018).